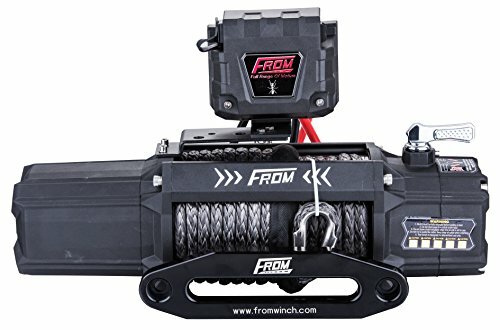 "FULL RANGE OF MOTION (FROM) ANT Series 9,500lb pulling capacity electric winch, 5.5 horsepower full sealed motor with 218:1 gear ratio provides high speed line pull, multiple mounting options control box for your convenient way. New designed clutch lever paint on electroplated for easy operation. It was designed to fit the off road 4x4 market for trucks, jeeps and modified vehicles. Its a workhorse for Tractors, Forestry, Police and Fire department work. Can also be used in light industrial applications. FROM INDUSTRIES LLC. offers a limited FIVE(5) years warranty to the original retail purchaser for each new FA winch, used as a recreational recovery winch only, against manufacturing defects in workmanship and materials on all mechanical components. Electrical components consisting of motors, solenoids, wiring, wire connectors and associated parts have a limited ONE (1) year warranty. New cable assemblies are warranted against defects in workmanship and materials when received by the retail purchaser. There is no applicable warranty after initial use. Warranty registration cards for each winch must be submitted at the time of pruchase or within 30days by the end user. FROM INDUSTRIES LLC.FA electric winches are intended for recreational self recovery usage. The warranty is void if the winch is used in commercial or industrial applications. 5.5 HP, 12V series wound motor and heavy duty 3-STAGE Planetary Gear System. Rated line pull of 9500 LBS, HAWSE FAIRLEAD included. WIRELESS REMOTE control conveniently and safety. AUTOMATIC braking locks rope to prevent free spooling. Limited 5-Year Warranty. If you have any questions about this product by FROM, contact us by completing and submitting the form below. If you are looking for a specif part number, please include it with your message.